We urge Democrats and Republicans to come together and negotiate in good faith to pass a FY ‘19 budget on time that is balanced. Long term budget projections are needed to help stabilize the State’s yearly budget process. The State should implement, at a minimum, a three year revenue and expense projection by program. Long term planning and projections can aid in the certainty businesses are looking for. Continue to explore options that address the back-log of unpaid bills. Continue the practice of department transparency and up-front reporting. Agencies need to take a very tough look into possible cuts. Each agency should be able to commit to a percent decrease based on reduction of ineffective, high cost, and low quality programs. Reform should start first with areas that have exact monetary impact, such as Procurement, Workers’ Comp, and Mandates. Continual population loss of individuals indicates a need to change the way the State of Illinois functions. Modern and efficient transportation resources are crucial, not only to reviving the Illinois’ economy, but also to maintaining and enhancing the economic vitality of the state. Illinois has grossly underfunded our basic transportation needs to the point where our backlog of investment needs has been at crisis levels. The Governor and General Assembly must take immediate action to develop and implement a capital spending plan so that our State’s transportation infrastructure needs and economic activity do not continue to languish. The Chamber strongly urges the Governor and General Assembly to set aside funds in a capital spending plan to address future expansion of these roadways. Both Interstates (80 & 55) are in critical need of expansion to accommodate significant truck traffic traveling to and from the intermodal developments (as well as future planned development) within the region. I-80, an extremely important link in the country’s interstate system, could use additional lanes from Route 30 to at least Ridge Road to provide safer and more efficient travel by the public. In the center of the Joliet corridor is the Des Plaines River Bridges, two aging structures that carry an anticipated $250 million plus price tag for replacement. The segment of this Interstate through Will County is the only location in the country to have a reduced 45 mph speed limit and is a recognized bottleneck for national freight movement. The Chicago Street/Route 53 ramp has become far too dangerous and is in immediate need for improvements. We recognize the need to explore the possibility of managed toll lanes on both I-55 and I-80, full toll possibilities on I-80, and the possibility of raising the gas tax as revenue sources to fund local transportation needs. I-55 could use additional lanes from I-80 south to at least IL Route 129 to provide safer and more efficient travel by the public. The I-55 and Weber Road interchange area has seen tremendous population and employment growth since initial construction in 1990. Severe congestion in this area has led to delays and has developed a chokepoint. Addition of new interchanges at Airport/Lockport Rd. and IL 126 would be an asset. We applaud the Private/Public Partnership plan to construct a new bridge connecting the northern end of the Inland Port with the existing Houbolt Road interchange on I-80. Future projections show truck traffic vol-umes growing dramatically on I-80 through Will County in future years without a new East/West alternative, like the proposed Illiana Expressway. We hope this alternate route is still considered in the future. The I-55 / Seil Road corridor has received recent attention to further a massive project at the crossroads of I-55 and I-80 to accommodate a development impacting the entire region. We support and urge all parties to continue working on all possible funding (P3) to make this project a reality. Local school boards and administration face the task of funding relief through local tax referendum increases – most often with no success. Education funding needs to remain a continued priority, seeking new and reasonable sources of funding (with equitable levels across the board) apart from the current property tax system. The Chamber supports legislation that will strengthen the articulation and accessibility between our education sys-tem and workforce needs. In particular, legislation that strengthens the links between high schools and employers through community-based learning programs, workforce development programs, and partnerships that will build employment related skills among students. Programs that enhance the ability of Community Colleges to educate and re-train the unemployed are a crucial need in our State. Additional funding for Community Colleges to expand their teaching programs and enhance aging facilities must not be overlooked. We support the need for MAP Grant funding and its importance to both Educational Institutions and Students. MAP funding is critical to help students who are low to moderate income go to college. The Chamber is currently weighing the issue of Pension Funding and the potential shift from the State to School Districts. Strong consideration should be given to the impact it has on the State Budget. The General Assembly can no longer pass unfunded pension mandates on local governments. State mandates on local governments should be funded or should at least be consistent with how the State handles its own pension liabilities. Current pension payments need to be a required priority in order to bring down the $120 billion plus unfunded liability. In addition, review the pension ramp to confirm the validity of an affordable and realistic time table to reach the 90% funded ratio. 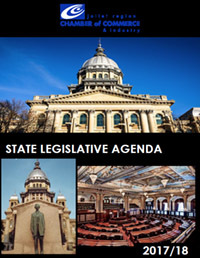 Illinois is currently spending approximately 20-24% of its annual revenue (general funds) to fund public employee retirement, and the percentage allocated through 2045 will be constant between 22.8% and 24.9% according to a COGFA report. This path is fiscally unsustainable. Pension costs will crowd out spending on education, public safe-ty, transportation and nearly every government service except interest on our debt. We cannot allow this to hap-pen and must act now. forward that will ensure greater cost-sharing and program flexibility. Efforts on proposed legislation that mirrors change that has been already deemed unconstitutional such as future increases vs. pay raises is likely to continue to be challenged. We are interested in monitoring proposals that in-clude lump sum payouts to inactive participants, private buyouts, and Tier III self managed plans for new hires. The Chamber continues to strongly OPPOSE the expansion of gaming licenses in Illinois. The increased revenue suggested by those who favor license expansion is suspect at best. In the last few years over 19,000 VGTs (video gaming terminals) have been installed in Illinois. That equates to 15 new casinos. While gaming revenues are certainly important to our State, we need to be fair with those casino investors who originally took the risk by investing millions of dollars in our communities. Sports Wagering in the state may become a possibility depending on a Supreme Court ruling. We believe the State of Illinois should be ready to act if and when this becomes reality rather than fall behind neighboring states. The Chamber believes that meaningful workers’ compensation reform is essential to a thriving economy and increased development in our Region and State. Illinois has an issue with workers’ compensation premiums being much higher (7th highest in nation) than in other states due to reasons with our system. Economic Development, expansion, hiring of employees, and increased wages are all area’s that suffer due to premiums. In addition to those in the private sector, Non-profit and Government entities also face these increased premiums which in turn become a burden on the taxpayer. Adding new penalties on Employers will not lead to improvements. Illinois job creators need comprehensive and meaningful reform of the Workers’ Compensation Act that will significantly reduce costs for employers – private and public sector – while protecting the rights of legitimately injured workers and ensuring their access to quality health care. We look to a causation standard change from “any cause” to a “major contributing cause.” Responsibility greater than 50% at work would bring Illinois in line with 29 other states. Traveling employee language needs to be cleaned up, and eliminate coverage which an employee is exposed to the same risk as the general public (neutral risk). Travel should be covered in the instance of performing job du-ties rather than language that covers if an “errand” is substantial. AMA Guidelines should be strictly followed to measure permanent partial disability (PPD) and a more balanced view of the medical condition through full medical records review is essential in determining awards. The Chamber supports review of minimum wage replacement ratios and a more moderate amount for maximum awards. In addition, situations in which employers are responsible for 100% of pre-existing conditions needs to be updated. Hopeful future change would allow employers to cover the percentage that was caused by actual work as determined by arbitration. Medicaid liabilities continue to grow despite the reforms that were passed previously that were rolled back by the legislature. Medicaid liability doubled between 2003 and 2015, growing from $6.4 million to $12.7 million. Chamber supports aggressive investigation to curb fraud. We support the practice of bulk purchasing and competitive bidding as ways to decrease costs. Taxing local hospitals hurts the communities they serve and diverts dollars that could be used to care for patients, and to upgrade equipment, modernize facilities and hire needed staff. Hospitals already provide $5.5 Billion in benefits to their communities annually, including more than $1 Billion in charity care alone (measured at cost). Hospitals are also strong economic drivers in their communities, generating $88.8 Billion annually for their local and state economies as well as employing more than a quarter million people, generating nearly 500,000 direct and indirect jobs. We are closely monitoring discussion on the possibility of legalizing recreational use of Marijuana. A number of concerns will need to be addressed when it comes to policies in the workplace. We are adamant that business leaders need to have a seat at the table if legalization takes place. Illinois is one of 11 states without term limits. Public opinion strongly favors term limits for elected officials and we are currently reviewing view points from both sides of the issue, especially limits on leadership positions. Increases in minimum wage fall disproportionately on small businesses that are least able to afford such a dramatic increase in labor costs. It also affects employers by increasing unemployment insurance and workers compensation insurance rates as well as Social Security and Medicare taxes. These increased costs may well force employers not to invest in business expansion and additional positions. Increases may require the layoff and/or reduction in hours of current employees. Our neighboring states of Indiana, Iowa, Kentucky, and Wisconsin all have minimum wage levels of $7.25 and Missouri is $7.85. Any increase may affect business location decisions, especially coupled with the highest unemployment rate of these states as well. We support and promote a competitive and fair tax climate that encourages entrepreneurship, investment and job creation. If any consideration was given to a tax increase, it would have to be coupled with major re-forms. We oppose any tax that hinders a pro-growth policy. Recent proposals to include service tax on a limited number of industries is worrisome. We are interested in consideration of an across the board minimal service tax, coupled with a reduction in the 6.25% sales tax. The Chamber is currently reviewing proposed consolidation of Township Government and the impact it could have on the State Budget. Human Service agencies suffer from low state reimbursement levels that fail to keep up with the actual costs of providing services. UIC and Illinois Partners for Human Service recently conducted a study of human service rates which indicates reimbursement rates need to increase significantly as rates have not kept up with inflation as measured by CPI. We seek to identify and address local business concerns that pertain to the economy and correct those that negatively impact the business climate. Illinois’ small businesses operate in an environment that includes high taxes, uncertainty generated from budgetary deadlock in the State Capitol and an economic recovery that has not kept pace with the rest of the nation. We support legislation that will reverse this trend. We strongly believe a centrally located, national transportation hub coupled with a highly skilled and diverse workforce positions our state to thrive once unnecessary hurdles are overcome. Districts in Illinois should be fairly drawn with bipartisan cooperation. Legislation to have an equal number of Legislators from both sides of the aisle is favorable in addition to Independents. The way districts are drawn is one of the most important functions of government as this determines how elections will be handled for ten years. Allowing the legislators to draw their own districts has shown electoral consequences of politicians and political parties choosing their voters instead of voters choosing their elected officials.